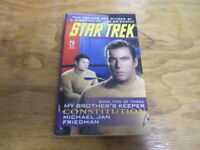 Star Trek SHADOWS ON THE SUN HC Novel Michael Jan Friedman (Pocket, 1993)! As a young doctor with a family and a promising career, Dr McCoy thought he had it all. But when the woman he loved betrayed him McCoy fled to the Starfleet. Now, 40 years later, he is surprised to learn that his ex-wife is one of the mediators that the USS Enterprise is transporting to Ssan.